mass in her home town of Detroit as she did every year. Ms. Murphy, the proprietor of the city’s first salon for black women, known as House of Beauty, found herself particularly moved by the musical performances that evening. In fact, she was so inspired that she decided to convert the basement of her salon into a rehearsal space for local gospel acts. Later that year, she funded the recording of local gospel star Rev. James Cleveland, and House of Beauty Records was born. Over the years House of Beauty was owned and operated by a number of different parent companies. It was during it’s time at Scepter Records in New York (’64-’76) that the label grew both commercially and creatively. It slowly transformed from a rigidly traditional label, mostly featuring a capella quartets and choirs, to a company with eclectic tastes and broader musical horizons. Throughout the 70s the label became more accepting of secular influence on its music and slowly but surely, some of the recordings became straight up funky. In the fall of 2008 Secret Stash began working with a local business man who acquired the House of Beauty catalog some years back. Our mission was to sort through his mountain of master tapes containing over 3,000 tracks in search of rare funky and soulful gems for vinyl reissue. After hundreds of hours we settled on a short list of material to press up on wax. However, shortly after an agreement was reached for the first small batch of releases, the local business man was raided by the FBI and charged with felonies for his involvement in a ponzi scheme. The catalog has since gone into receivership (for the second time in its existence) and no more licenses have been executed. It saddens us to say that the future of this amazing collection of music is unclear at this time. Gospel Funk may sound like an oxymoron to some, however, in the late 60s and throughout the 70s, many Gospel artists began moving their sound in a funkier direction. When you think about it, it’s really not that hard to imagine. Most of us know that soul music is deeply rooted in gospel. Sam Cooke, Aretha Franklin, Al Green, and even James Brown all hail from the world of gospel music. Is it really unimaginable that the gospel community would latch onto the progression of soul music that took place in the secular market? 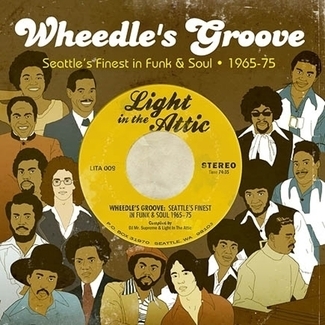 This collection of Gospel Funk is raw, gritty, and packed full of breaks. The compositions are tastefully simple, the production is organic, and the music is undeniably funky.